The latest Rallye S has a few new features, the most noticeable being the ultra-thin satin lacquer finish, so thin you can feel the grain texture! The wiring on this one has changed too with a volume for the bridge humbucker and another for the middle and neck single coils. I did this so that each pickup would have the proper valued potentiometer for better tone all around. The tuxedo humbucker is my 302 and the singles are my calibrated hot vintage models. The tremolo is a Gotoh 510 and tuners are Gotoh staggered Kluson style. The neck is tempered quarter sawn maple with an ebony fingerboard. Both the side and top inlays are blue Luminlay. The neck has a great vintage feel and the tone is very open but drives when you want it to. Twin Daytonas! One righty, one lefty, each features a tempered alder body, maple neck with macassar ebony fingerboard, Gotoh hardtail bridge, and my custom 302 and VTH5n pickups. Tuners on righty are locking Gotohs while lefty gets locking Hipshots. Each has the eye-catching metallic red finish on the body and flat lacquer finish on the neck. Weight wise, each one come in at just under 6.5 lbs. Here's a Daytona that will make some lucky lefty's day! This one features a Honduran mahogany body with a quilted maple top, three piece quarter sawn maple neck and Amazonian rosewood fingerboard! The pickups are my 302 in the bridge and VTH-5 in the neck for great versatility and clarity. Other electronics are the standard Daytona individual volume, toggle and master volume setup. Hardware is a Gotoh hardtail bridge and locking tuners. The blue abalone Q-parts knobs help to accent the deep ocean blue burst! Hardshell SKB case included. The new GTX 7 is here just in time for the new year. Its neck-thru-the-body construction uses carbon fiber reenforced, four piece tempered maple for the neck for added stability and rigidity on the road. Honduran mahogany and a flame maple top ( with a Turtle Burst finish,) make up the rest of the body with an ebony fretboard on the neck. The 25.5" scale gives enough tension to the strings without making it too difficult to bend. Laminay dots are on the side and top of the fingerboard to help out in low light situations. The pickups are my Super Commando in the bridge and VTH-7 in the neck for crunch and clarity. The Floyd Rose has been hot rodded with titanium blocks and stainless steel screws for corrosion resistance, while the tremolo arm has been replaced with the "old style" Floyd Rose arm. Like the Daytona model, the GTX 7 is a full on shredder! Happy Thanksgiving all! Here is the newest Rambler in Capri Cream! 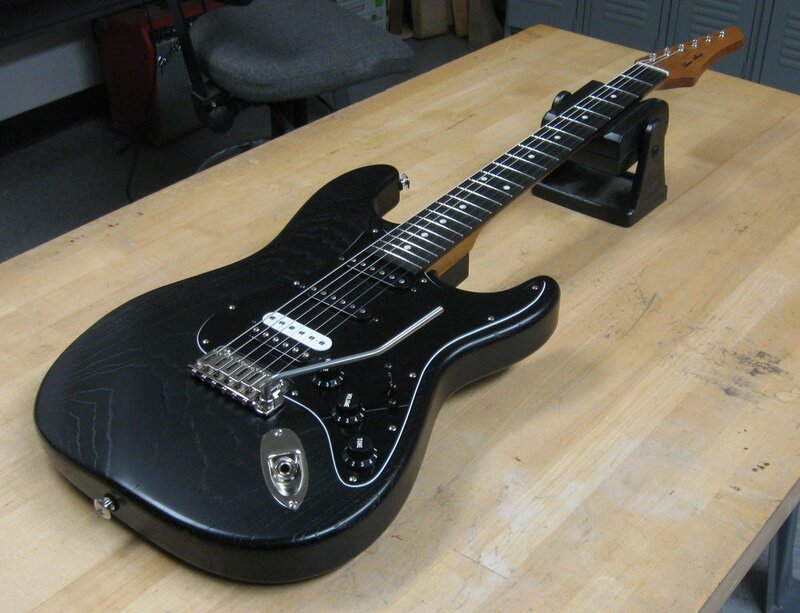 This one has a torrefied maple neck with a striped ebony fingerboard. The body is torrefied ash. This guitar weighs in at around 6.5 lbs.! The 24.75" scale and 12" radius makes for easy bending all along the neck. The pickups are my VTH-2 in the bridge for great bell like clarity and the 225 mini in the neck for warm bluesy tone. Today is the launch of the new Alonzo Guitar's website! Be sure to check in to see what's new at Alonzo guitars! Just in time for Halloween we have a brand new Daytona in Tangerine Scream finish! It has a torrefied ash body, single piece quarter sawn neck with ebony fingerboard. The fret makers are from LumInlay. Hardware is the Gotoh hardtail and locking tuners. The 440 humbucker and 225 FB mini-humbucker provide diverse tones for full on shredding or bluesy rhythms. Like all Daytonas, this one is light weight and has super easy access to all of its frets. If you're interested in this or any other of my guitars you can contact me at alonzoguitars@gmail.com . Welcome to the new Alonzo Guitars' Website! Be sure to check in often to see the latest guitars and basses available for sale!